With the employment rate at its highest in 46 years*, many employers are finding it increasingly difficult to find the right talent to plug their skills gaps. So when business is booming but the permanent candidate pool is dwindling, what can businesses do to ensure productivity is not lost? Temps, contractors and freelancers. Whatever you may call them, temporary workers can be essential in keeping your business moving. 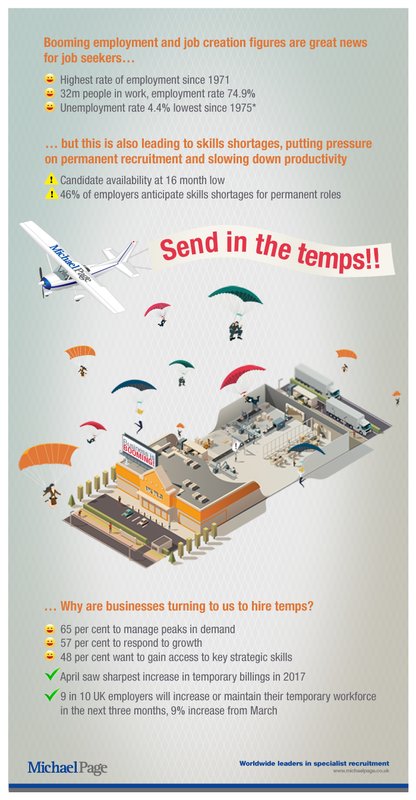 Take a look at the infographic below to see why businesses turn to temps to ensure that they continue to meet demands and grow. Contact us today to discuss how we can find the temps to keep your business moving.